This is the Road To Hell? Not entirely sure if Chris Rea would nod and agree? However. Hard Rock fans and yours truly are certainly no stranger to Joe Lynn Turner and his impressive back catalogue. From the successful stints fronting Rainbow, Deep Purple, Yngwie Malmsteen and through his heralded solo career, the New Jersey-born singer has had his vocal talents on display for decades. Time passes and merely the JOLT is as electric as ever before? Indeed. Lightning strikes as he's one of those singers that hasn't completely lost touch with his audience nor the flexibility of the pipes. Overall, Road To Hell, merely slightly heavier than some of the previous Sunstorm albums and more towards the Malmsteen and Neo-Classical genre. Nonetheless. Opener, "Only The Good Will Survive", sounds pretty much as you would expect in the past, with the AOR and impressive guitar work by Simone Mularoni from prog metal rockers DGM's. The title track feature the Yngwie Malmsteen-esque riff and style and flashy Mularoni, constantly coming up with the fun lick and trick. "On The Edge", more of the same and I can't stop thinking about the JOLT fronted Yngwie album. On the other hand. "My Eyes On You" sounds like something Yngwie could do one-handed in his sleep. We've heard this particular riff and structure a million times before. Deja Vu dreams come true? Hardly rocket science. It's one of those albums that are quite easy to put into context. Especially since it feature Joe Lynn Turner, his voice will instantly turn the average effort into something familiar, cozy and safe. 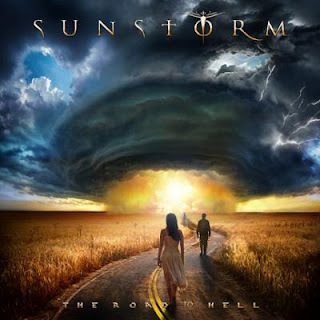 Road To Hell sees the Sunstorm Project strive to drive their sound baby steps forward, while at the same time appealing to those fans which are reluctant at the prospect of change. It's not easy to please the long time fan. One word review: Solid... as a rock. Wait. That's more than one.